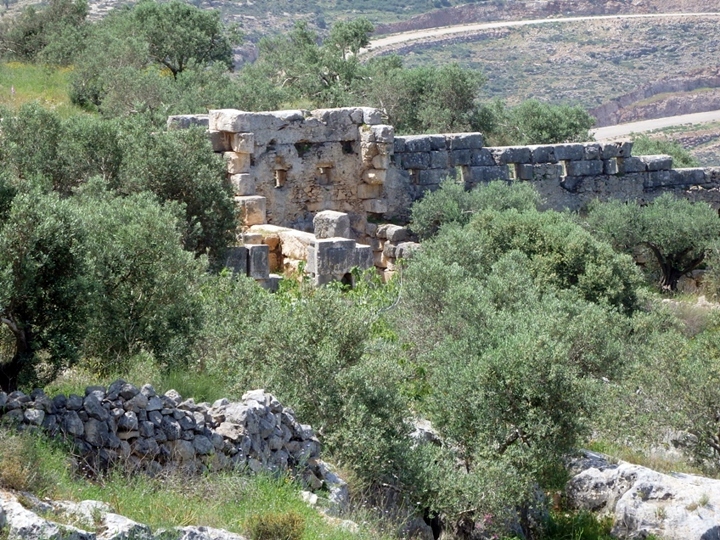 Ruins of a Roman fortress and Byzantine monastery in Western Samaria. Deir Qal'a ("Monastery of the castle") are the ruins of a Roman fortress and Byzantine monastery. 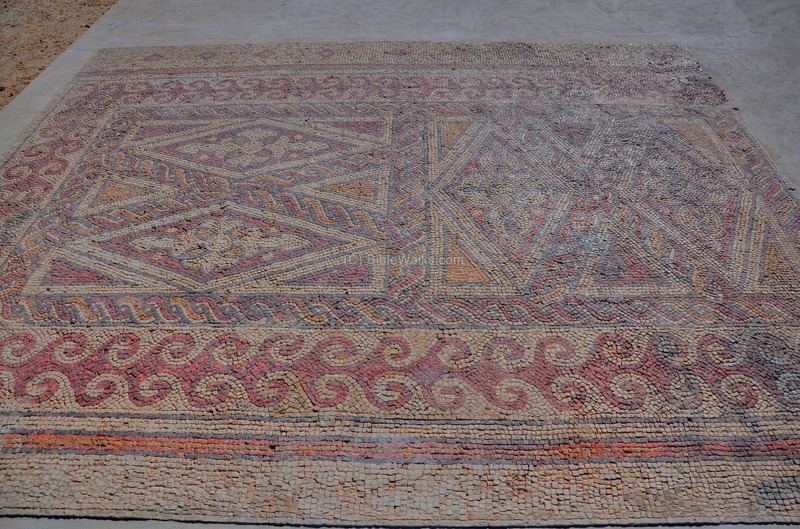 It is located in Western Samaria, near the communal village of Peduel. The massive Roman fortress is dated to the 4th or 5th Century, while the large church (47m x 45m) is dated to the 6th C. This was a fortified station situated on crossroads of major Roman roads. An aerial map of the area indicates the major points of interest in the area of Deir Qal'a, which is marked by a yellow square. 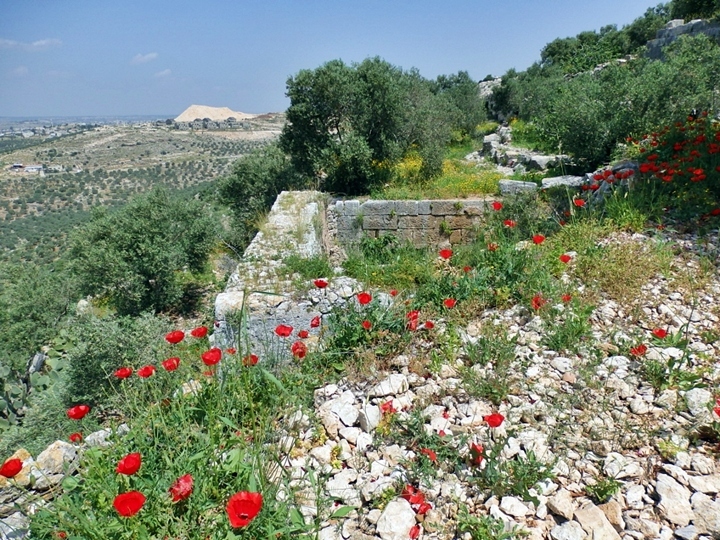 The site is located on a steep ridge that overlooks the valley of the Nahal Shiloh stream. Other ruins of Byzantine period monasteries are located in its vicinity. 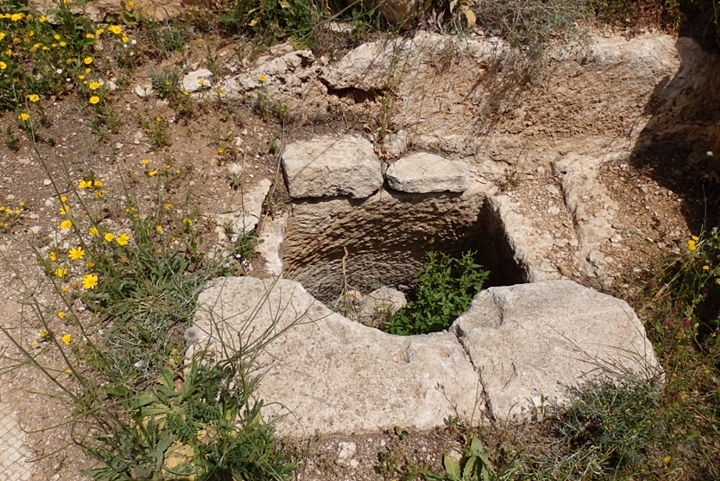 The entrance to the ruins is through the west gate inside the village of Peduel, near the army preparatory (mechina kdam-tzvait). A mighty fortress was built here in the fourth to the fifth century, in order to protect the strategic roads that passed in the valley of Nahal Shiloh. The location of the fortress was selected to be constructed on a very steep and defendable hill, and was built with high walls and towers. It controlled a strategic location, at the crossroads of two major Samarian roads, and a regional route along Nahal Shiloh. The Peutinger Map (Tabula Peutingeriana) is a medieval map which was based on a 4th C Roman military road map. It is oriented west-east. Jerusalem (left side of the map), through Gofna and Shechem, to the north west (Sharon, Caesarea). A section of the Peutinger Map (Tabula Peutingeriana) - The location of the the site is indicated by a red square on the side of the road from Shechem to Caesarea. A second phase of construction changed the fortress into a monastery. During the 6th Century, a church was added in the open courtyard, with additional changes to the structures. Deir Qal'a has strong similarities to Deir Sam'an, 1.5km northeast of the site, with similar construction methods and two stages of construction - a fortress in the late Roman period and then a monastery during the Byzantine period. 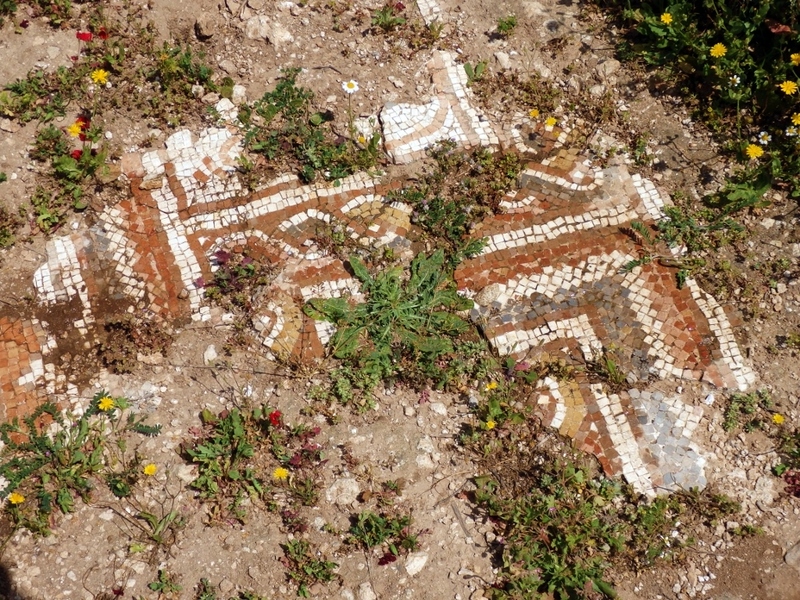 According to the archaeologist Y. Hirschfeld, who conducted a survey in Samaria and this site, the large number of monasteries in the area were built in order to protect the Christian villages in the area south of Nahal Shiloh, following the Samarian uprisings in the 6th century. The monastery was abandoned during the Early Islamic period, went out of use during that period, and remained in ruins since then. Conder and Kitchener surveyed this area during the Survey of Western Palestine in 1882. They reported on their account of the site - spelled Deir Kulah - with great details that are reserved for important sites. 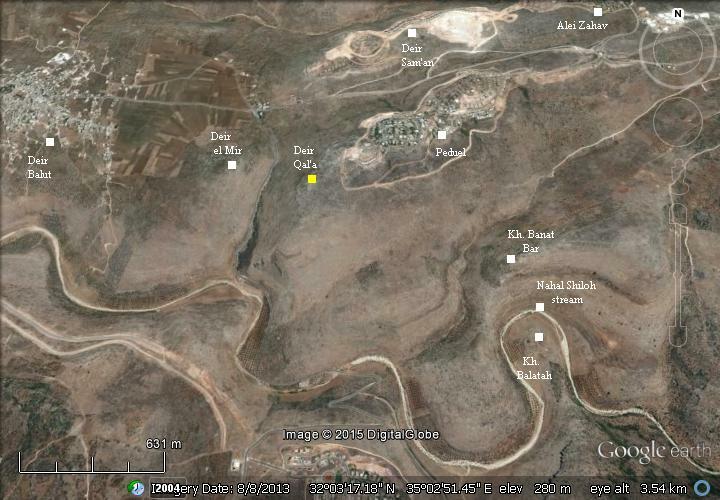 Their map on the right shows the location of the site, north of Wadi Deir Ballut (now called Nahal Shiloh). "Deir Kulah - Perhaps the finest and best preserved of the ruined monasteries in Palestine, situate in a very strong position on the edge of a precipice, and protected by deep and rugged ravines on all sides except the cast, on which side the quarries form a sort of ditch. A narrow path leads up on the west from the small plain of Deir Ballut, passing under a projecting turret on brackets. The building, being on the side of the hill, is on three levels, east and west. The principal remains are those of the church, and of a great hall (apparently the refectory) south of it, with a square tower on the east at a higher level ; and a huge birkeh north of the tower with two smaller again north. Outer Walls. The ashlar is of fine proportions ; the stones all drafted with a draft 1o inches broad, and 2 to 3 inches deep ; the raised face is rudely dressed, and the draft is irregularly cut. The corner stones are in some cases 6 feet long and 3 feet high, but the average is about 3 feet by 2 feet. The retaining- wall on the west is 20 feet high, and the turret 14 feet square and 6 feet high ; the top on a level with the floor of the enclosure within. 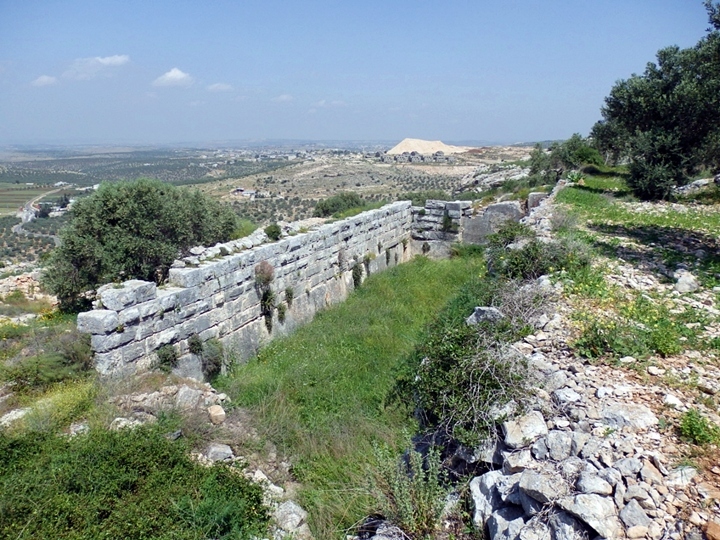 The masonry of this wall resembles in appearance that of Justinian's fortress on Gerizim. The Church measures 80 feet long by 23 feet wide inside, including a narthex of 12 feet at the west end. The walls are standing to a height of 16 feet to 18 feet. The east apse, 18 feet diameter, has a window in it, the sill 7 feet from the floor. A cornice runs round the apse 10 feet from the floor, and is remarkable, because it is bent so as to follow the line of the semicircular arch of the window. This feature resembles the cornice of the Golden Gate at Jerusalem, and that of the church of Kalb Louseh, ascribed by M. du Vogiie to the sixth century. On the right of the apse a cross is sculptured, standing on a globe beside the cornice ; and a line of ornamentation running up the wall exists above the cornice, with debased classic moldings containing the cross on some of the bosses. The cornice is 18 inches high, and this band of sculpture is 23 inches wide. The Hall is separated by a court 42 feet wide from the church and measures 34 feet in length by 26 feet in breadth, divided into two aisles by two piers supporting three semicircular arches 7 feet span. Above these arc five windows, and in the south walls of the hall are also five windows ; in the north wall three windows, and a door surmounted by a flat lintel with a low relieving arch above it. The lintel is 8 feet 4 inches by 2 feet 9 inches ; the arch has seven voussoirs, and a very narrow keystone, the haunch-stones broad. On the lintel Is a winged tablet, with a Greek cross in a circle upon it. West of the hall is a chamber, with a roof 1 2 feet from the floor. The hall had a roof at not less than 20 feet from the floor ; the chamber was 8 feet wide, and equal in length to the width of the hall ; on the south a window ; on the north a window and a door. The door has over it in situ a lintel about equal to the last, with a relieving arch of five voussoirs. On the lintel a Latin cross standing on three hemispheres, the conventional sign of Calvary. A third doorway leads into other chambers, of which there seem to have been five in all, a total of 47 feet by 26 feet inside. The third doorway is surmounted by a flat lintel, 2 feet 4 inches high, 7 feet 1 inch long, with a tablet and cross in a circle as on the first. Beyond these chambers is another chamber 26 feet square, with five windows on the south wall. Thus, the total external length of these buildings east and west is 128 feet by 32 feet external breadth. The whole of the masonry is of good ashlar, not drafted. Only one column base was found fallen in the ruins. The Tower is 30 feet square outside, with walls 4 feet thick. The entrance is on the north, with a lintel-stone 6 feet 10 inches by 2 feet 4 inches, and a relieving arch formed by cutting out the under side of two stones. 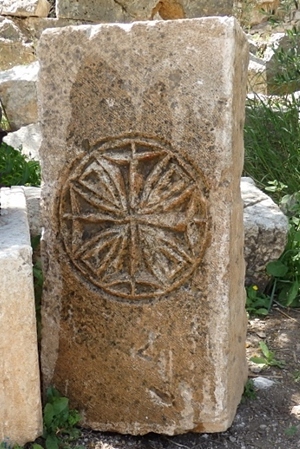 On the lintel is a tablet, with large wings, and on this a cross in a circle. A drafted stone occurs in the wall to the left. The floor of the tower is 14 feet above that of the chapel. The roof still remains, built of rubblework, with a tunnel vault. The Birkeh measures 111 feet north and south by 34 feet breadth. It is cut in rock, and 15 feet deep; there is a sloping cutting at the sides, evidently to support the haunch-stones of a vault over it. The sides are in places built up to a level with rubble. North of this great tank are two smaller ones, 38 feet north and south, and respectively 18 feet and 9 feet wide. All these tanks are lined with a hard brown cement full of pottery. one with a circle round it. as at Sebbeh. (Sheet XXVI.) They are as shown. The joints are well and firmly laid in the masonry. No pointed arches were found. The vaults are all tunnel form, and not groined. 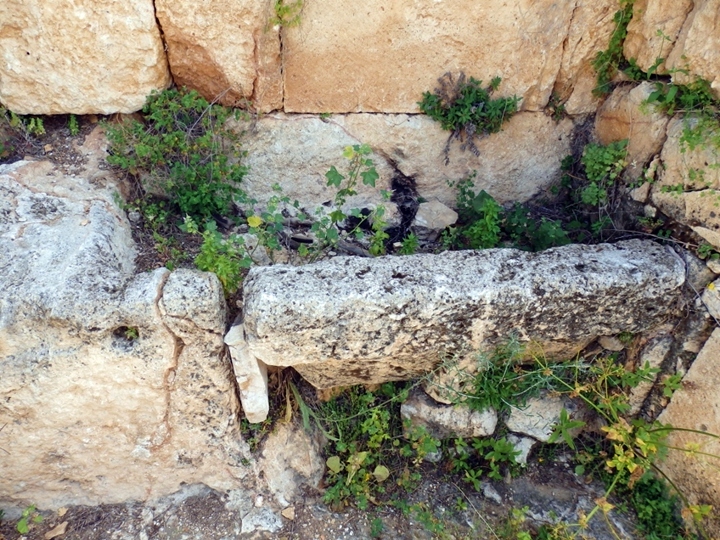 Rubble is used to form the core of the walls. The masonry in the interior is smooth and not drafted. All the characteristics of Crusading work are absent. There are two caves on the west, one about 30 feet long, the other 20. The path ascends by steps. There is also a very large quarry east of the site, and a rock-sunk tank on the south-west. 1st. The drafted masonry, resembling that of Justinian's work on Gerizim. 3rd. The semicircular arches, with a narrow keystone and broad haunch stones, and an odd number of voussoirs [ = elements of an arch]. 4th. The flat lintels, with relieving arches above. 5th. The debased classical character of the cornice moldings. These serve to indicate that the building is of the Byzantine period, and not Crusading. Visited and planned, 2nd June, 1873". The fortress, church, and an adjacent farmhouse, were excavated by Y. Magen and N. Aizik in 2004-2006, and reported in detail in Magen's book. They identified the site as a late Roman fortress (4th-5th C), which was later converted to a fortified monastery during the Byzantine period (6th C). 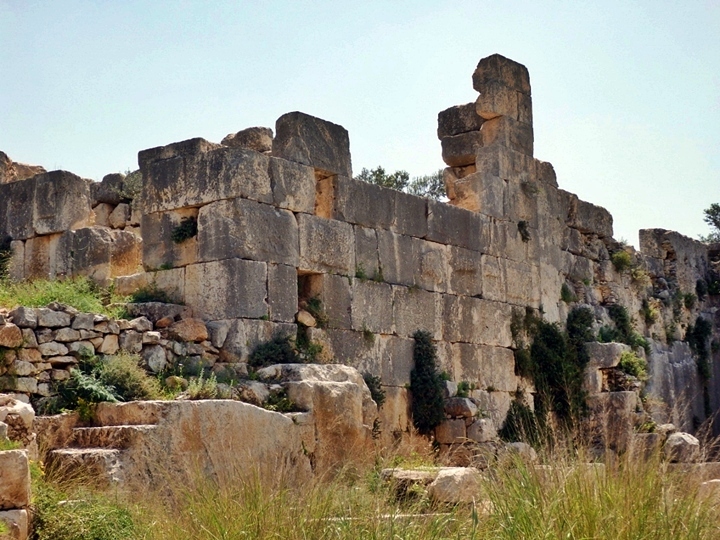 They concluded that "this was one of the most important fortresses in southwest Samaria", as its walls reached three stories high, the towers protected it on the east, the narrow entrance to the fortress, and the steep hill that left it protected from three sides. The site is accessed from the modern community of Peduel. The fortified complex is built along the foothill, and is terraced. Its exterior dimensions are 58m (190 ft) by 69m (226 ft), with the long axis directed north-north-east. The eastern wall is located along the continuation of the ridge, and was the weakest side of the fortress. In order to protect it from that side, a moat was dug along the wall, and a 10m (33ft) high tower was added on its south east corner. This photo shows the southern wall. The walls surrounding the complex are of the late Roman period. The main entrance to the fortress is located at the western end of the southern wall. It is narrow, approximately 90cm wide, in order to better protect the fortress. On the lintel is a faint Latin cross standing on three hemispheres, which is the conventional sign of Calvary (Golgotha). 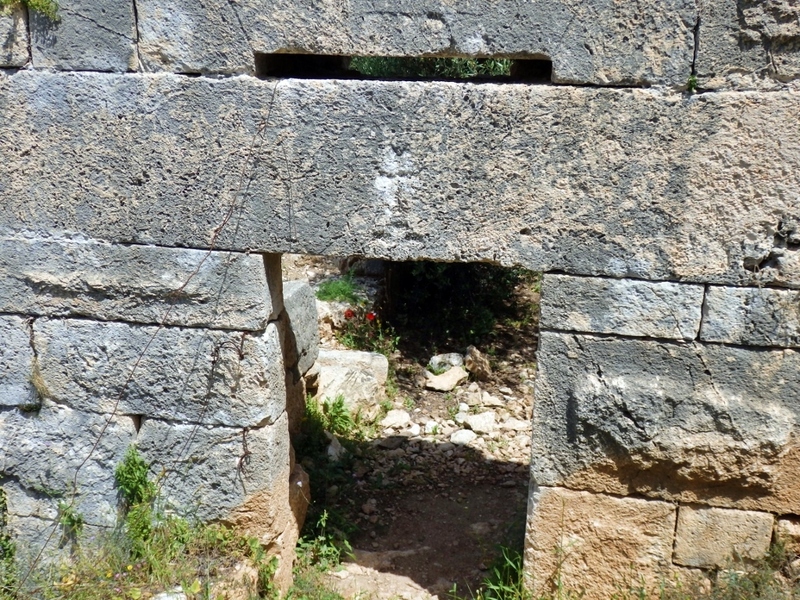 A relieving arch, or space between the lintel and the arch, is used in the construction of the doors. The eastern wall, and a section of its tower, is seen in the following photo. The watch tower monitored the area and the road along Nahal Shiloh. The apse of the Byzantine church is located on the hidden right side, facing the eastern wall. A staircase leads up to the tower. An inner section of the western wall, facing north, is seen in the next photo. This may have been the dining room, as the PEF report wrote about it: "The principal remains are those of the church, and of a great hall (apparently the refectory) south of it". Around the site are four large caves, which served as water reservoirs. On the western side is a large cave built with two levels, with a small seasonal spring on its lower level. Water supply was an important engineering challenge, as the droughts in Israel required large reservoirs to survive the dry seasons in an area which lacked sufficient natural water supply. The site contained two cisterns, a large one on the east and a smaller one on the south west. 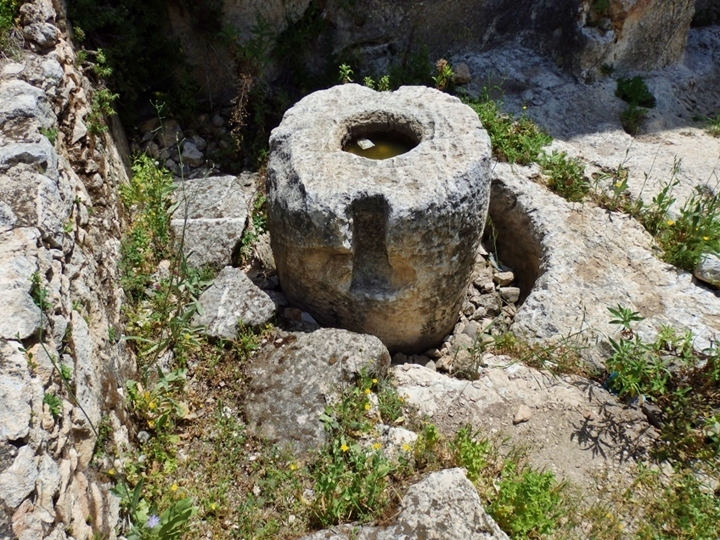 An oil press installation is located in the monastery. It was initially built as a wine press, then converted for producing oil. The church is located in the center of the vast complex. It was added in the second phase of construction. The PEF report wrote about it: "The Church measures 80 feet long by 23 feet wide inside, including a narthex of 12 feet at the west end. The walls are standing to a height of 16 feet to 18 feet. The east apse, 18 feet diameter, has a window in it, the sill 7 feet from the floor". * Right - a byzantine cross inscribed on one of the stones. * Below - a section of the mosaic floor. 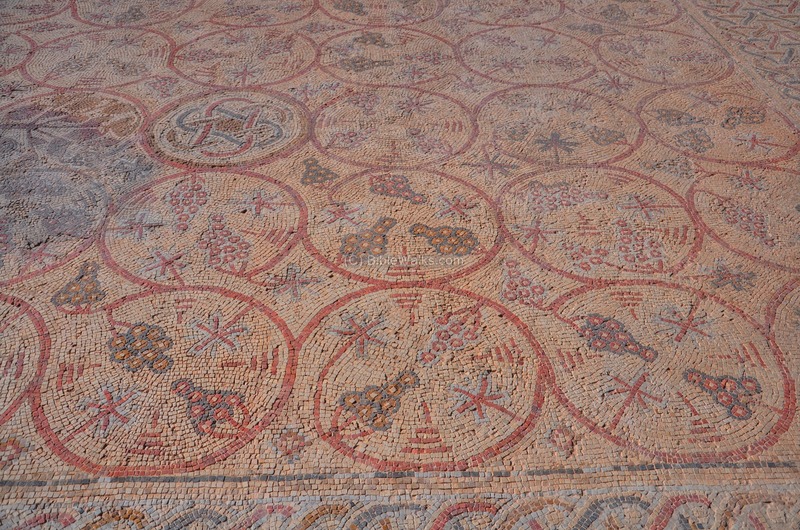 The church was decorated with rich mosaic floors. Some of the floors were transferred to the archaeological museum in the Good Samaritan Inn, where they are on display. One of the most beautiful sections, from the northern side of the apse, are standing in the entrance to the museum. 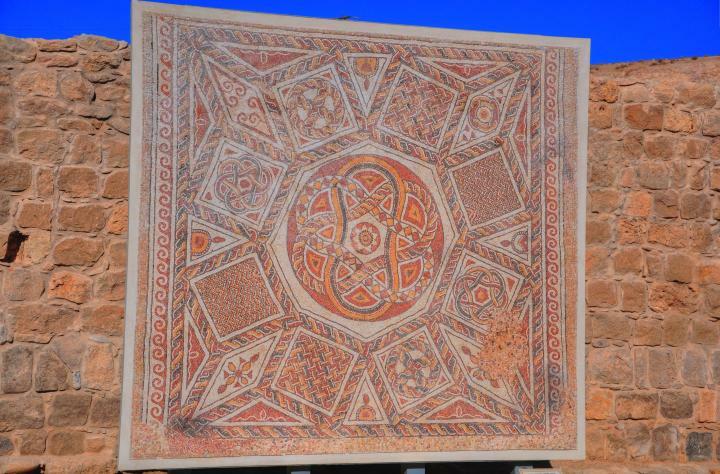 The decoration with geometric patterns, without figurative objects, is common in the mosaic floors of early churches. 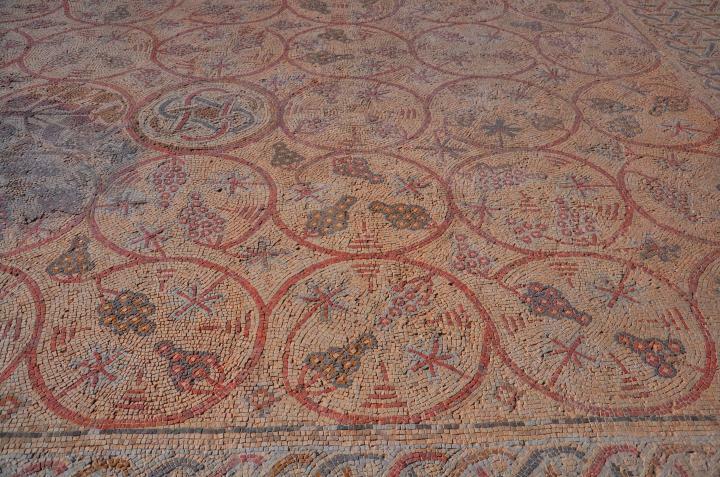 The figurative decorations , such as floral, animal and village/hunting scenes, started only in the late 6th C.
The floor from the northern Chapel is shown in the next photo. Here are some figurative objects such as grapes, as started in the late 6th Century. Deir Qal'a (Kal'a) - Arabic name of the site - monastery of the fortress. Deir - monastery - a common prefix of sites in the region. Deir Kulah - name on PEF maps. Peduel - an Orthodox Jewish communal village established in 1984. Hebrew: ransomed of the LORD. (Isaiah 35:10): "And the ransomed of the LORD shall return, and come to Zion with songs and everlasting joy upon their heads: they shall obtain joy and gladness, and sorrow and sighing shall flee away". of Western Samaria. 209-249 (Hebrew).